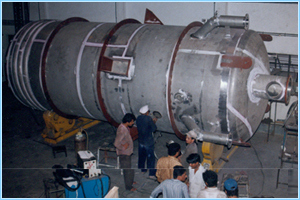 Our company is a renowned manufacturer, supplier and exporter of a vast variety of Process Equipment's. These equipments are designed in accordance with industry quality standards. 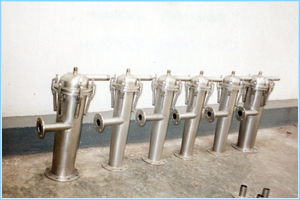 We provide variety of process equipments in different dimensions and sizes as per the clients requirements. Our products are widely known for their durability and retains quality and finishing for a long span of time. Being one of the most prominent manufactures and exporters of various engineering products, we are involved in offering our esteemed clients a huge gamut of Powder Blender / Mixers. Our comfortable and user friendly blenders are manufactured by using superior grade components and modern technologies. Entire range of our blenders are followed by industrial standards. Intricately designed these equipments are applicable in various industries. To mix dry powder & granules these Industrial Powder Blender are considered very suitable and effective. 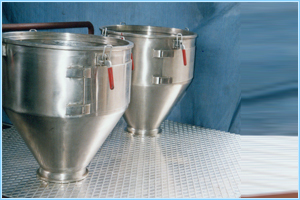 These blenders are extensively used for cosmetic powder, food, chemicals etc. These blenders are efficient and versatile equipment used for mixing powder and granules homogeneously. All the contact parts of the blender are made from materials with grades as required by customers. Our blender offers uniform mixing and easy discharge of material. The Oil Extractor machines offered by us are fabricated using premium quality raw material procured from reliable sources. Our provided extractors are manufactured with quality materials and superior technology in adherence with industrial standards. Furthermore, these products are widely demanded in the market for its high durability and long lasting nature. Our valued clients can avail these products from us at competitive rates. To meet the different requirements of various customers, our range can also be customized according to the requirements & design by customer. Being a quality-centric organization, we are well known for offering to our customers a vast collection of Heating Coils. Our provided range is accurately fabricated using unmatched quality raw materials and contemporary techniques at our latest manufacturing unit. The offered coils are widely cherished and demanded in the market for their ruggedness, high quality and elevated durability. Range : Tank Heating Coil, Industrial Heating coil, Super Heater Coils, Evaporator Coils, Vessel Heating Coil etc. We are instrumental in providing a wide array of Powder Hoppers that is intricately designed using advanced technology in compliance with the set quality norms. Checked on various quality parameters, our range is customized in accordance with the set quality norms. Owing to its superior quality features, our range find application in construction, chemical and food processing industries. 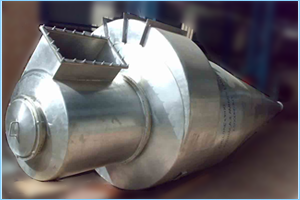 We are Manufacturer, Supplier of high efficiency Industrial Cyclone with high temperature capability. These cyclones find their usages in product receivers, as pre cleaners to high efficiency fabric-type dust collectors or as independent collectors for coarse dusts. These are also designed to handle extremely high dust concentration. Each spare part of the equipment is accurately tested and grounded and is in high demand owing to their exquisite finish and elegant design. Our Cyclones operate to collect relatively large size particulate matter from a gaseous stream through the use of centrifugal forces. Dust laden gas is made to rotate in a decreasing diameter pathway forcing solids to the outer edge of the gas stream for deposition into the bottom of the cyclone. 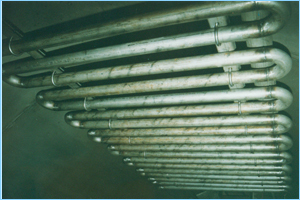 We are engaged in manufacturing, supplying and exporting Powder Conveyor Systems. These systems are manufactured using high grade raw material. Moreover, our experience has given us knowledge in conveying different kind of materials and also designing custom built equipments. Powder conveyor system is method of conveying powdered material such as powder & granules of different sizes. 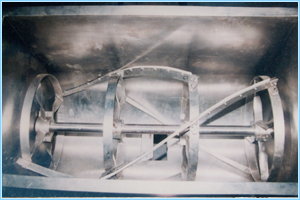 Moreover, this unique product includes efficient performance, dust free closed systems, requires less spacing and provides dependable and gentle conveying. 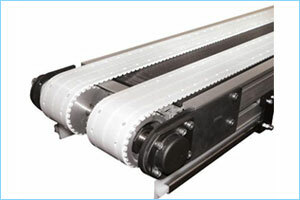 We are expertise in manufacturing Belt Conveyors & our wide range of Belt Conveyors is useful for transferring material from one place to another which is quite distant from each other. Our belt conveyors are very much useful in variety of industries like Automobile, Engineering, Process Plants and many more. We also manufacture tailor made belt conveyors system for handling food grain in bulk for various grain based industries and sugar factories.